The DL Special – A New Quilt Pattern Now Available! What do you get when you combine four-squares, HST’s, and a little sashing? The DL Special! This month Mom and I worked on recreating a quilt Mom made back in 1977 and a new pattern is available in our shop! Mom’s 1977 Quilt consisted of 3” x 3” Four-Square and Half Square Triangles. She used only 3 different fabrics and arranged her units in such a way that an intricate pattern emerged. This Green and Yellow quilt has been loved and cherished for so many years so we thought it would be fun to recreate it and give it a modern touch. In order to re-create this effect, we made our units slightly larger and added ½” white sash borders. For our DL Special (named after “DL” – my dad’s nickname for Mom), we used 3 fabric prints from Amanda Herring’s Ardently Austen collection from Riley Blake. We are obsessed with this collection and unfortunately the prints are getting harder and harder to find! Want to see more from the collection? Check out our Ardently Austen Grocery Bags! Our DL Special Quilt measures at 40” x 50” – a perfect size for a baby crib or toddler bed. The design is sleek and modern. The colors are bright and cheerful. And honestly, we think this quilt is perfect for a baby girl or baby boy! We used minimal straight-lined quilting in the ditches of all the sashes and ¼” inside all of the units. The quilt is soft and light-weight. For the quilt binding, we used the same Coral that you see in the half Square Triangle units. And for the quilt back, we used another print from the same collection – a print that features beautiful medallions in the same colorway. The DL Special – A New Quilt Pattern! This baby quilt was fun to make, but pressing and making sure the seams nested together, well – that was a doozy! Luckily our DL Special Quilt Pattern walks you through every pressing and nesting step. Our DL Special Quilt Pattern comes in 3 sizes: Baby, Throw, and Twin and we can’t wait to see the quilts you make with our pattern! The DL Special – Baby Quilt Available in our Shop! As is usually the case in quilting, this quilt needs A LOT of cutting, sewing, and pressing. We try to do a little every day and next thing we know – we have a new and spectacular finished quilt! This finished quilt is available in our shop. The DL Special is a really neat way to highlight 3 distinct colorways and we can wait to see what versions of this quilt you create! Previous PostHow to Make a Triangle Baby Quilt – A New Quilting Class! 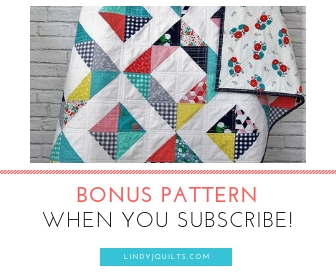 Next Post HST Squared – A Free Quilt Pattern!